When Caroline and I met up with Pablo Moix at Copa d'Oro a few weeks back, he hinted at some Valentine's cocktails he had in the works for the One Group (where he works at), I was unfortunately a bit busy up till mid-February (Caroline's got the lowdown on the lovely cocktails here) so didn't get a chance to check out STK until this past Friday, since I was going to be in the area for a friend's dinner gathering. 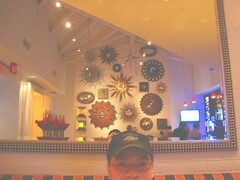 Of course, having tasted "Pablo's Tuesday" at the Copa, I was excited about what he has to whip up for the weekend. 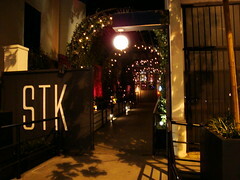 Wanting to avoid the weekend invasion crowd and not be late for the party later, I swung by STK around 6:15p -- it's a surprisingly beautiful space that I really haven't noticed on my previous drive up and down La Cienega. Between the fire pits, plant arch entrance and the high ceiling and dark furniture, it's modern loungy atmosphere with just enough glitz without being gaudy. And supposedly an identical twin to the New York branch . . . 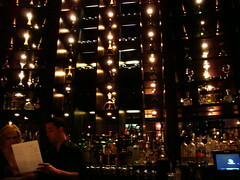 When I got the bar, Pablo was speaking with another bartend about the specialty drinks he crafted for Oscar weekend (e.g. emphasis on Moet Hennessy distributed stuff, since their bubbly is the exclusive Academy Awards champagne.) They all looked very tasty, so after Pablo greeted me, I asked him, "if all these are your babies drowning in a lake and you can save only one, which would it be?" And so, he proceeded to make the Pimm's Smash . 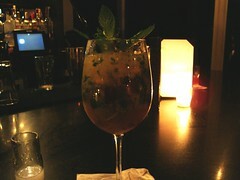 . .
with Glenmorangie single malt, Pimm's No. 1, mint, lemon and topped with powder sugar. Rich yet refreshing, my first thoughts of this drink was a mojito with a depth and complexity -- a little butterscotch, a little fresh herbs -- a little... crack?! (well, that's how I felt like when Pablo told me I got some powdered sugar on my nose and upper lip) Nonetheless, I think it serves the purpose Pablo intended, to make Scotch whiskeys a more approachable spirit and a cocktail component by complementing its character. 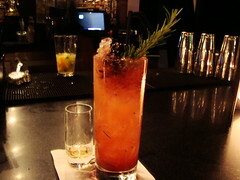 Speaking of herbs, I noticed a cup full of fresh-looking mint, basil and rosemary at the bar, so I basically ask him to "surprise me with something that's got rosemary" -- so he made a concoction with rosemary-muddled Matusalem Gran Reserva rum, lemon and orange juices, topped with a float of blackberry and diluted honey and cup of packed crushed ice. Loved the visual effect as the dark purple threads slowly drip down into the golden drink, and the taste itself is a heavenly layered woven tapestry. For the foundation, a citrusy punch with the presence of burnt sugar and vanilla from the rum, and every now and then a pop of color from the woodsy rosemary sprigs or the sweet, juicy vibrance from the blackberry honey. Definitely a bespoke cocktail that's worth putting in a menu! Lastly, when Pablo heard I pretty much drink everything except absinthe, he took that as a challenge made me a cocktail that he's sure will change my mind (and thus, I've dubbed it the "Absinthe Challenge"cocktail.) Using Kubler absinthe, it was then mixed with his homemade grenadine and a gamut of stuff from the produce aisle (orange, lemon, lime, cucumber, mint and red grapes) and topped off with ginger ale. How healthy-sounding! And true to his word, I had no trouble with this absinthe-based cocktail -- the anise/black licorice presence is still there, but not annoyingly overbearing, it actually added a pleasant spicy note to this salad of a cocktail. Apparently, my enjoyment of the drink is noticeable, since a couple sitting next to me at the bar observed my happiness and ordered a glass too! Will surely come back for a drink if I ever find myself around WeHo again, and who knows, next time I may even stick around for a bite of steak (or is it Stk?) too. Or maybe I'll drop by One Sunset next time and take advantage of their Tasting Tuesday dinners after my cocktailing. What Do Others Say (About the Food)? - LA Mag noted its slogan ("not your daddy's steakhouse") makes it sound scarier than it actually is. - Buzz of LA considers it a "welcome addition" to the dining scene and hopes it will be a "local classic"
- Food, She Thought said the service is perfect and the food is good, but "nothing groundbreaking"
Thanks to bargain-hunting pal Esther, found out that Goldstar is selling discounted tickets to Jonathan Gold's "Gold Standard" tasting event. Instead of the original $60 + ticket fees, it's now $42.50 ($36 + $7.50) service charge. If you've been on the fence on whether to go because of the price, hopefully the ~ $20 off will push you over. It certainly did for me! Already got my ticket and hope to see you there. P.S. one more bargain to add - for those who don't mind being Opening Week guinea pigs, West Hollywood's Cecconi's (which took over the old Morton's space) is offering half-off food from now till Feb. 27. Mostly Italian fare with a little modern Californian touches (the tuna/salmon tartare, local beets salad) but could be promising. Thanks to FauxLAHipster for heads up. 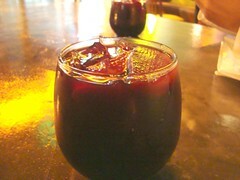 When Caroline and I tried out some of the amazing drinks at Copa d'Oro, their eats menu haven't debuted yet. We weren't particularly feeling like take-out from Buddha's Belly next door (which is what the bartender recommended to other hungry boozers, even pulled out the to-go menu for them to scan), we decided to take a hike around the Promenade to see what foodventures we can get our drunken butts into. We first walked to FIG, but that was exactly one day before they opened so no dice there. So instead we hopped to Riva, the relatively new Santa Monica outpost from Jason Travi (of Fraiche fame) specializing in casual Italian fare (focus on crudo and pizza) with a contemporary touch. Having relatively light appetites but crazy sweet tooth (OK, maybe just me for the latter), we decided to share one pizza and two desserts. But the drinks menu also had an interesting list of libations. Since we were pretty much cocktailed out, we both got a beer. 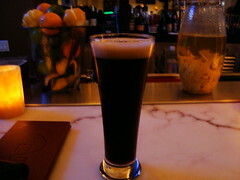 Mine was the Black Orchard from the Bruery for $4, which was surprisingly light and easy-to-drink despite its dark color, but well-rounded out with hints of spice and considerable depth and character. 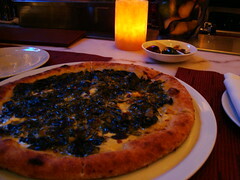 It actually held up really well with the pizza we ordered . . .
. . . the spinach and gorgonzola ($14). The toppings were simple (and no tomato sauce) but the ingredients melded beauitfully like a creamed spinach with a piquant sharp tang from the cheese and a subtle garlic-onion flavor. The crust was wonderful as well with its exterior thin crispiness quickly breaking into a soft, doughy and slightly sweet inside. More spongy than chewy compared to the other artisanal pizzerias, but that's a-OK with me. 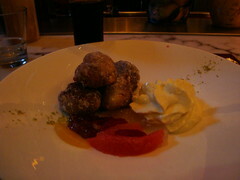 My dessert of ricotta fritters ($9), served alongside citrus segments and a cream foam, was excellent. 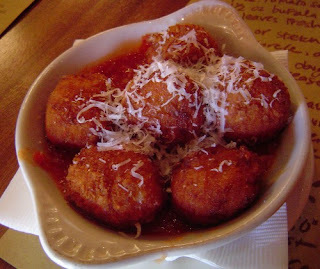 Fresh and crispy from the fryer, the ricotta lends a pleasant moistness and cheesecakey flavor to the fritters. If this is what New York Times meant by breakfast for desserts as a trend, I'm all for it! 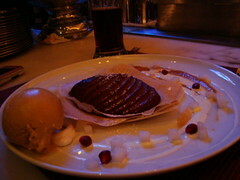 Caroline ordered the torta della nonna ($10), with roasted pear slices atop layers of crisped mini-crepes with a side of caramel ice cream. The flavor combo of the three works and this dessert was good, but was lacking that little extra edge to make it memorable, but if you're craving a apple/pear tart-ish dessert a la mode, this is a decent one to try. So there's my quick take on Riva. I enjoyed the few dishes on this foodventure and I look forward to trying more of their eats, drinks and service in the future (particularly around their daily happy hour from 5 to 6:30 p.m.). But along with Anisette and FIG, I'm really glad that there are so many more non-chain options encircling the Promenade now. This can only be a good thing for the savvy shopper and the finicky foodie like me. - TripleCreme forgot her camera, but loved the food, spotted celebs and "can't wait to return"
The Bazaar's way-too-garlicky Rossejat, one of two-and-a-half reasons why I couldn't understand S. Irene's perfect score for this restaurant. This week, the biggest shocker of news was finding out that LA Times' S. Irene Virbila gave the Bazaar a perfect four stars (which she hasn't done since 2005, to Joel Robuchon in Vegas.) Probably more surprising to me since my experience there was merely good and not stellar in every way (especially with two dishes that missed!) -- part of me wants to concede to her more experienced palate and another part just wants to brush off my meal taking place on their off-night. But, ultimately, I'll just agree to disagreeing with Ms. Virbila -- but I will say the Bazaar is worth at least checking out once (or even a few times) if for the sheer amount and variety of eye- and tastebud-candies there. In happier news, Ms. Lesley is making a comeback - twice over! EaterLA may never be the same without her, but now you can read her at the newly debuted Tasting Table LA, a daily e-newsletter that's definitively more focused on the town's food and drinks than DailyCandy/Urbandaddy/Thrillist/etc., exploring L.A.'s eats with a nice scoop and summary of the scene, the crowd and, of course, the menu. 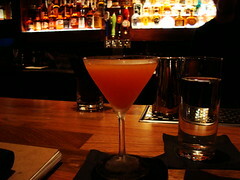 Additionally, she just started ChowBalla, a more personal, casual and lengthier take on L.A.'s food and drink happenings. Already, on ChowBalla she got the lowdown that XIV is abandoning its infamous, mind-boggling "everybody orders the same prix-fixe" setup for a more traditional appetizer/entree/sides/dessert menu setup. Both are surely worth keeping an eye on in addition to EaterLA, which has been getting better at covering news and rumors actually relevant to L.A. In my own foodventure discoveries, I've finally tried Kyochon's Korean-style fried chicken (a.k.a. the Kogi of last year) at its Rowland Height location -- my take? Pretty good, but also felt it was overhyped -- I like the extra-crispy skin from double-frying as well as the sweet-savory soy sauce that the chicken's been marinated in, but like Bazaar and Kogi, nothing mind-blowing and I think I still like the heavier breading of Soul Food Southern-style fried chicken more. Still, the lunch bento box is a rather nice deal for $7.50 (two fried drumsticks with chicken bulgogi, salad, french fries and rice) so I'll likely check it out again if I'm near one of their locations, maybe I'll opt for their spicy style next time. Or maybe check out Bonchon next time to compare. For the party host(ess) looking to put a new spin on hors d'oeuvres and appetizers, Pamela Sheldon Johns, author of 50 Great Appetizers, will be doing a book tour at various locations in L.A. & O.C. this coming week signing books and doing cooking demos highlighting small bites that are simple to prepare, yet sophisticated in presentation in flavor. Some small bites she'll whip out during the cooking class tour include roasted garlic and leek soufflé, potato-red onion flatbread and crispy parmigiano shells with mixed greens. For the full schedule of her tour through Southern California, click here. 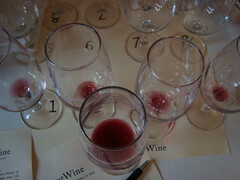 Next up is a fun event from LearnAboutWine for the wine appreciating dog lover. 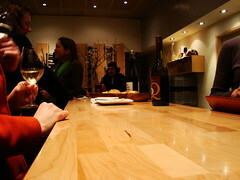 On March 7 they will host "Much Love for Dog and Wine" at the Lofty Dog Academy in the Arts District downtown. Over 20 wineries will be pouring, and bites will be offered by local eateries including Pitfire Pizza, Wurstkuche and Café Metropol. And of course, as the name suggests, you're more than welcome to bring your dog (licensed and on a leash) to the tasting -- a great opportunity for humans and canines alike to mix and mingle! Costs $49/person advanced or $60 day of - for more info or to buy, click here. 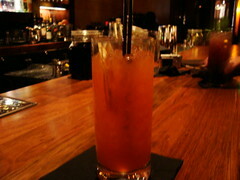 Lastly, Edison is debuting with punch nights on Wednesdays from 5-7 p.m., not a huge surprise since their resident bartender considers punches the "it" cocktail that's about to become trendy. And I definitely can't disagree, especially at the budget friendly price of $4/glass or $25 for a whole bowl! Great way to share the good times with a few friends for not a whole lot. 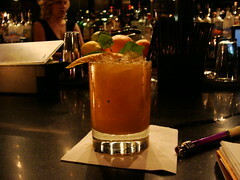 Just like food, I love it when bars and restaurants take advantage of fresh, seasonal produce to make tasty and innovative cocktails. Of course, it's also great to know an experienced set of hands are making those drinks - so I am especially delighted with the recent opening of Copa d'Oro in Santa Monica, bartended by pros like Vincenzo Marianella and Damian Windsor. I'll admit to coming with a bias, when I first heard of their "build-your-own-drink" menu I thought it was kind of hokey, 'cause really -- can't you do that at just ANY bar? Then I read their menu and realized that they featured many farmers-market-fresh ingredients that not so readily available at just any ole bar -- and the concept made more sense. Tell them what base spirits you prefer (with a regular and an upscale option, for $9 and $13 respectively) and the fruit / herb / vegetable flavors you want - then sit back and let the bartender take care of the proportions and other ingredients as needed to make that delectable drink. On my first trip here with Caroline and Esther, I felt like something refreshing and fruity - so I asked Damian for something with 10 Cane rum, strawberry and ginger. 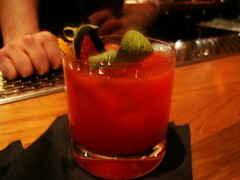 He made a drink with just that, balancing it with agave nectar and a dash of Angostura - it was sensational! Definitely a more summery drink, though I expected that already when I ordered it, it was fruity without being too sweet, with nice caramel-grassy-sugarcane undertones from the rum and rounded out with the bitters and spicy ginger. My second custom cocktail is "something with Sagatiba, raspberry and sage" - which was then combined with lime, simple syrup and kumquat. This came out delicious as well, and considerably more complex with the fruit-sage contrast and the zinger from the 'quat. Tasting this, I don't know if I can go back to just an ordinary capirinhia again! Finally, I decided for something off their pre-built menu -- "Pablo's Tuesday" (though w ewere there on a Monday) made with applejack, Aperol plus freshly squeezed lemon and orange juices (see? I'm being healthy!) Nice and punchy, I can easily imagine myself batching this up for a party! And believe or not, the inventor of this drink - Pablo Moix of the One Group - happened to be there at that time, so we had a nice chat about his upcoming cocktail creations. Three drinks later, Caroline and I (Esther left earlier) reluctantly closed out our bill -- only to find many of our drinks comp'd! 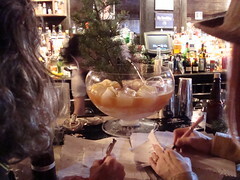 The bill that did came out was $14 for each of us -- of course, we tipped generously. But even at full price ($9-14), it's still a very worthwhile experience -- and I can't wait to return to taste a few more delights while munching on their fancy seasoned bar mix or maybe even order a panini. Friday Quickies #48: If I Only Had the Money and Time . . .
Plan as I may, life always have a way of throwing curveballs. That's exactly what happened when I found out about a few awesome food events happening in the coming weeks, right after I allotted my dining out budget on other things (mostly the recent restaurant weeks.) But alas, both happenings sounds amazing and if you have the free-time and wallet-space for it, get your tickets now! 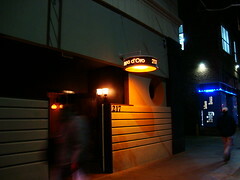 Also around the corner is Jonathan Gold's "Gold Standard" tasting event on Mar. 8, where Mr. Gold has gathered 30 of his favorite eateries to offer up dishes for all his fans and readers to enjoy in the swanky Smashbox Studios. 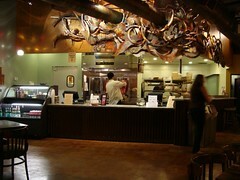 The list of participating restaurants runs the whole gamut from All-American to pure ethnic, low-end to high-brou, well-established classics to brand spanking new, with representation from the likes of Providence, Sona, Wurstkuche, Hungry Cat, Jitlada, Mr. Baguette, Kyochon and La Casita Mexicana. There will also be beer and wine samplings as well as a cash bar. Event costs $60/person ($10 for kids 10 and under). While sorting a little confusion with their PR folks on the opening date, they offered to host me for a meal there. Alas, I wasn't expecting to be in Santa Monica area on opening week so I passed on their offer. And what happened next? Due to an unexpected chain of events, my friend and I wound up there on opening week anyways. Darn it! Oh well, since we already ate a bit beforehand, I wasn't planning a full meal there anyways so I figured I could enjoy a few nibbles to get an idea of their offerings. The menu definitely reflects the seasonal flavors, and I love how the bottom highlights what produce are at their peak or soon on its way. But it was mildly frustrating to see that the menu listed hen of the wood mushrooms as a peaking ingredient, but I didn't see it featured on any of the dishes (and the waiter assured me there are no off-the-menu specials either); so sad, since I haven't tasted those in a while and was looking forward to them. My friend was feeling carnivorous so he opted for their 12 oz. 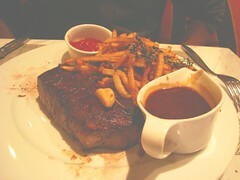 New York Strip steak frites. I decided to get three small dishes to get a greater variety of flavors, asking for the starter to arrive first and the soup and side dishes to come with my friend's entree. 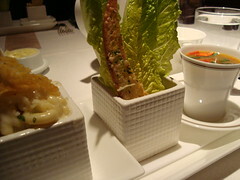 Shortly after our orders, the bread/butter and amuse arrived. While I love the presentation of the warm demibaguette arrived in its own little paper bread bag, I was also thinking "how not-so-sustainable . . ." But I was quickly distracted from that by the "green butter" dip, which tasty and intriguing for both of us since we can't quite place our finger on what the other ingredients in there are. Herbs? Avocado? Pistachios? all the above? I would've asked the waiter but he's already away before I got the chance. 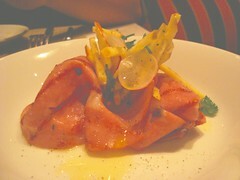 Moving on to my first of small dishes: grilled mortadella with pink lady apples ($7). Quite sensational, the sausage was mild and tasted more like a ham, and it was nicely complemented by the crisp and sweet apple pieces and the tinge of smokiness from being grilled. 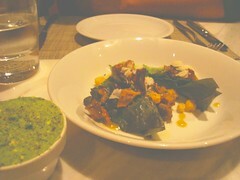 Shortly after we finished this starter, I was served was their roasted tomato soup with basil and marscarpone ($9). A little bit confuzzling since my other dish and my friend's entree wasn't ready yet. 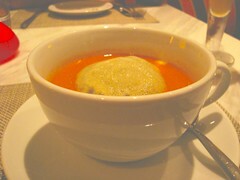 Nonetheless, the tomato soup overall went above my expectations esp. since most of my tomato soup experiences came from a can or a carton thus far; the flavors were vibrant with bright notes of acidity and sweetness, it certainly wasn't like anything I've had before. Would've liked a little bit more mascarpone cheese and I am unsure about the basil foam topping (personally would've appreciated the more natural presentation of chopped up leaves in the soup) but it was a delectable dish nonetheless. Finally, my accompaniment of sauteed cauliflowers with hazelnut and sage ($9) - again a well-done dish whose simple preparation highlights the freshness of everything that went in it. 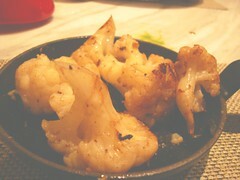 The cauliflowers were perfectly cooked, and their almost-buttery flavor was nicely accented with the nut and herb nuances. I am definitely going to experiment with that hazelnut-sage combination myself when I cook my veggies at home! 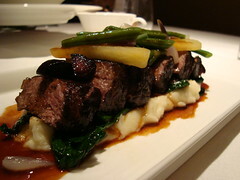 What of my friend's NY Steak ($29) - also solid. A perfectly cooked medium-rare, it was juicy, beefy, tender with an amazing crispy-caramelized sear of fat on top -- this is the reason why I can't even become a pescatarian or just a bacon-loving vegetarian. The fries were nicely done too, having been flavored from herbs that were either fried with them or tossed in right afterwards, but seemed to lost some crispiness. 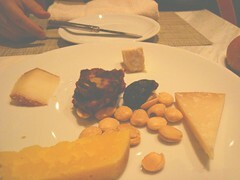 Finishing off our meal, a shared cheese plate. They offered several flights at pre-set prices (or a build-your-own at $4 per cheese), but our server was rather unhelpful on explaining the flights (telling us "Local" is all locally-made cheeses, and "Progressive" is going from mild to strongly flavored ones when we are more interested in the exact cheeses featured in each flight.) Alas, in the name of trying "the region's best" we went for the local flight ($17) . . .
. . . which turned out about 50/50, I personally liked the first cheese (which has a brie-like creaminess but with tinges of gorgonzola flavor) and the very last one (which was pungent but goes surprisingly well with the figs or the fruit-nut bread slices.) The other two hard cheeses in between are a bit unremarkable. While I did like their crystallized structure and snap, I found both too salty to eat alone. Despite the somewhat disappointing final note, FIG is overall solid and competent in the food -- it's a great spot to hit up for simple-yet-elegant fares where the flavors of the raw ingredients really speak for themselves. The service was waffly, though I attribute that more to opening week kinks that hopefully will get worked out. And while it is fairly pricey (aim for about $40/person on food) I definitely would recommend this place as the occasional splurgy or special occasional meal or even their wonderful-sounding cocktails, which, like the cuisine, is inspired by what's available and in-season. And I wish the best for Chef Garcia -- menus that need a regular makeover are always an ambitious undertaking, and I hope that he can pull it off through the seasons. I for one can't wait to see what the next batch of fresh produce will bring to the restaurant and bar. If I knew DineLA restaurant weeks were going to be extended and that Orange County Restaurant Week was rolling around the corner, I probably would've just dined at one place during Newport Beach Restaurant Week. Alas, having foresight as myopic/hyperopic/astigmatic as my actual vision - I decided to check out another restaurant; after scanning the menus, I chose Palm Terrace -- the menu looked solid and interesting at the same time (particularly the curiosity-sparking "Caesar Fondue" starter) so I wrangled my friend Khoi for dinner here on the last day of NB resto week. 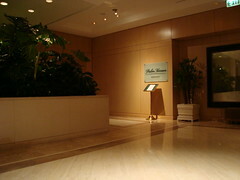 Located in the Island Hotel -- next to the Fashion Island mall -- the Palm Terrace has that "hotel restaurant" look; it's hard to accurately pinpoint, but I just get the feeling that it's more a venue for business lunches, catered event affairs or for hotel guests to have an upscale meal as opposed to being a destination dinner place. The decor / ambience felt pretty standard if a tad sterile: cloth-covered tables with cushy chairs and boothes, modern-elegant china- and glasswares, with the abundant tropical touches, such as painted palm fronds, to stay in character with the restaurant and hotel theme. The environment might have that hotel restaurant feel, the initial service and bites definitely disarmed that. The bread service was fairly impressive; we were given our choice of five different warm rolls (I had a pretzel mini-baguette first, then a cheese roll later) and surprisingly, we were served an amuse . . .
. . . of seared tuna with a tomato-y juice with microgreens. Ultimately, I liked the gesture more than the bite. 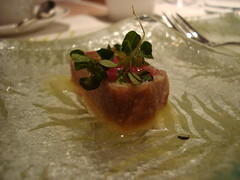 The tuna, with a little bright acidity from the juice, was alright, but wasn't really a nice little delight that an amuse should be. 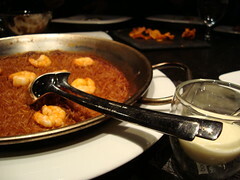 Next up is a trio of appetizers, a tortilla soup, the caesar fondue and their signature mac 'n cheese. I started with the soup, which is one of the better-made versions. It could've been spicier, but I appreciated the smokiness and that this is not oversalted (a regular occurrence with soups, particularly if they've been left simmering too long). For the "fondue", I was underwhelmed to find out it's merely long romaine leaves and an elongated parmesan crouton partly submerged in caesar dressing, but the taste was solid and it was a little bit fun to be eating a salad with my hands (and I can see it being a tasty and somewhat healthy entertaining / catering idea.) The mac and cheese was fairly well made (though I could be biased since there's truffle oil involved), but the taleggio cheese sauce could be thicker. Overall, a fairly ambitious gamut of starters and with the mild exception of the "fondue", it pretty much delivered on its promises. 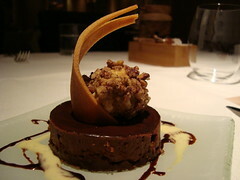 Concluding our meal is a Valrhona Chocolate Obsession - a ganache cake with a gianduja crust, candied-pecan coated caramel ice cream with drizzles of creme anglaise and chocolate sauces. Deeply satisfying for a chocoholic like me, it's an endless wave of rich cocoa flavors, highlighting what a difference using a high-quality chocolate like Valrhona makes compared to the run-of-the-mill generic brands. The ganache was wonderfully complemented with vanilla from the anglaise and the nutty caramel from the ice cream, with a nice crisp-and-crunch factor from the crust, the artsy cookie swirl, and the bits of candied pecans. 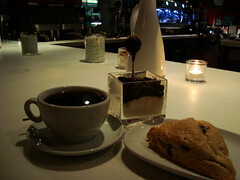 I'm tempted to come back here just to taste this again. And I just might after finding out that for the entire February, they're doing a Dessert Buffet event -- yes... all-you-can-eat sweets, for $18/person or for free if you order two or more courses for dinner. And in my 20/20 hindsight, I'm very glad I didn't bail on trying this place out. OC Weekly called exec. chef Bracken's menu "part Asian, part European and part American, but all innovation"
Not much going on for this weekend for me asides from processing the slew of press releases and advisories for Valentine's Day "specials" (though my personal take it is that it's infinitely more romantic to do something at home . 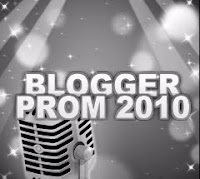 . . no waiting in lines, dealing with promoters/bouncers or potentially getting annoyed with rude table neighbors.) And in case you're shopping for wine on a budget (for Valentine's, or anytime) -- Rundown has a list of bargain buys at Trader Joe's for $10 and under a bottle. 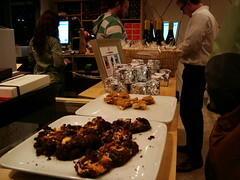 Per a tip-off last week, I checked out the Jin Patisserie grand opening event at Century City. It was a nice classy reception with a variety of finger sandwiches and sweets, though I would've preferred having tea instead of red wine. Despite the more chic-boutique feel of this store, I think I still prefer the Venice outlet more for now. If you think parking near Abbot Kinney is tough, wait till you head to Century City, where the only option is the hotel valet. 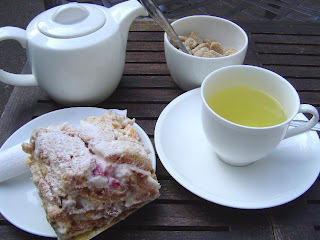 Also, I prefer the Venice's courtyard atmosphere for the soothing afternoon tea. 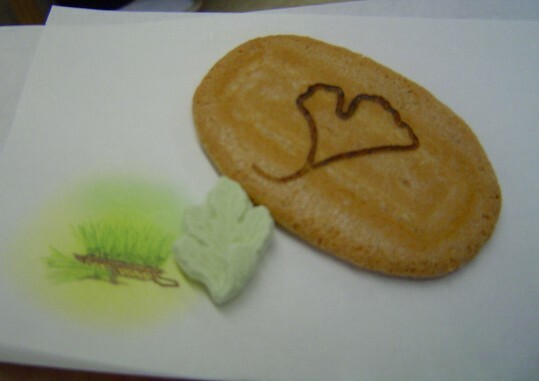 But hey, if you live/work near the C.C., Jin is a worthwhile checkout -- their sweets are very elegant and flavorful, and somewhat light and never too sweet. Finally, my fun read this week - Slate.com recently published a food writer's piece on making restaurant dishes based on their cookbook recipes, then comparing to the real deal by sampling those dishes at the eateries themselves. No shocker really, but even for someone with a culinary degree, while "all of the recipes I tested resembled their originals . . . none perfectly recreated the restaurant version," largely owing to recipe tweaks in the cookbook versions, but also due to factors such as a home vs. professional kitchens, and chefs switching the recipes to take advantage of what's seasonal. Interesting food for thought for the home cook looking to recreate that Alinea dish; though of course, we all know it's mostly food gawkage. I tend have a pretty carefree and playful attitude towards wine, order a sparkling shiraz for a birthday, or get a blanquette de limoux to pair with sandwiches, and there are other times when I'm interested in learning a little more about the art and science behind the production and tasting. 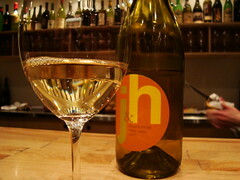 But ultimately, my advice is to "be explorative and open-minded, and drink whatever you like!" Sure, points and medals are some indicator of quality, but your tastebuds and nostrils and perception are unique, and hey, if you happen to like a wine that didn't earn 90+ points in X and Y guide or 'zine, that only means you can get an enjoyable glass for cheap ;). For those who still have trouble figuring out what they do like; fortunately L.A. is ripe with opportunities for you to explore, taste, analyze, discuss and form your opinions. Sure there are events like LA Wine Fest where you can try a lot and meet plenty of folks, but it's quite easy for the tastebuds and nostrils to get muddled and tired out after a dozen tastings (even in those minute portions.) Thankfully, wine shops around town are doing plenty of smaller events that let you try a few wines, learn some fun factoids and tidbits, and have a great time mixing and mingling with the staff and other wine drinkers in a casual, non-snooty setting. Tuesdays and Wednesdays at Morry's of Naples: the mellow backroom of this Long Beach wine store has some eclectic and cleverly-named wine flights, including "Italian Stallions", "On Your Guard for Chard", "Whisper Sweet Somethings" and "Bubblicious" -- and on Tuesdays, they're all $10 (normal prices are around $12-16 range). And if you get here before 7 p.m., you can enjoy their happy hour food menu too -- I highly recommend the $10 chef's choice cheese and charcuterie combo. Alternatively, come here Wednesdays and enjoy happy hour prices all night long (5-10 p.m.) with $2 and $3 drink specials in addition to the food bargains. Thursday Night Flights at Silverlake Wine (5 to 9 p.m.): a little more lively than the Monday ones since folks are gearing up for the weekend, you can choose from a few flights at $12/each to enjoy with breads and artisanal butters. To sweeten the pot, recently they partnered with Let's Be Frank to have their truck out there during the Thursday tastings, so you can enjoy gourmet, organic hot dogs to go with your wine. Sundays @ 3 p.m. at Silverlake Wine: Yes, it's the third Silverlake Wine event I'm highlighting but what can I say, they're a great place. The Sunday tastings are not only fun and fabulous but filling too, since Silverlake Wine's Sunday tastings are usually paired with foods from a notable local eatery or catering service around town. 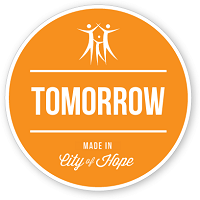 Sometimes it might be baked goodies and homestyle dishes from Century City's Clementine, other times it may be foods made with local fare from Heirloom L.A. For 4-5 tastings with dishes to match for $20/person, this is a wonderful way to bid farewell to the weekend. R.S.V.P. is usually required for this one (since they need to approximate how much food to prepare). Finally, nearly all week long (Tu-Fri 6 to 10 p.m.; Sat & Sun 5 - 10 p.m.) you can check out the swanky underground cellar/tasting room of 55 Degree Wine, which offers weekly rotating wine flights at around $15 each. If you feel the urge to nibble, you can order a salumi plate or cheese boards, which also changes seasonally. Whenever I head to Little Tokyo (or any of the satelite Japantowns in L.A.) I automatically think I should be eating Japanese food. So it was a bit funny when I first received an invite to check out Spitz, a doner kebab store situated right in the center of that neighborhood. So now I can have falafels, doners, pitas here too? But hey, it's meat roasting on a vertical spit and I can't say no to that, moreso if it was complimentary, and it was a nice excuse to meetup with bloggers Caroline and Sarah. I met up with Caroline at next door bigger-and-better American Apparel (another sign Little Tokyo's a-changing) and we headed into Spitz around 6:30 p.m. before the others. It was Wednesday, we just got out of work, so we made a beeline for their bar and their beer/wine menu. Their rotating selection featured some pretty eclectic brews (Stone Brewing Co.'s Levitation Ale, Craftsman Heavenly Hefeweisen & Holiday Ale) and the wine list is modest but interesting (Syrah and Verdejo from Spain, Gruner Veltliner from Austria, Merlot & Malbec blend from France, etc.) We also love the fact that beers can be served in canas (about half a pint glass) for $3-4 each, for those who just want "a little beer" (I can see this being great for lunch hour) or folks who wants to put together a sampler tasting of their own. As tempting as the beer and wine selections looked, our eyes already honed in on the final item on their menu: the cardamom spice sangria made with apples, oranges and lemons; that definitely hit the spot. It was wonderfully refreshing but with a considerable oompf, with the wine adding lushness and body and all the flavors from the fruits and spices marinaded within; an adult kool-aid if you will, more sophisticated and complex, less sugars and artifical colors. I dig it. 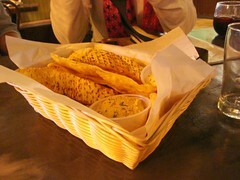 While waiting for Sarah, Beth placed an order of lightly-fried pita strips with hummus dip. The hummus was alright, but I was impressed with the pita strips - not too greasy and it had a wonderful crisp but still a tender, chewy interior. And definitely more interesting, and probably healthier, than fries. 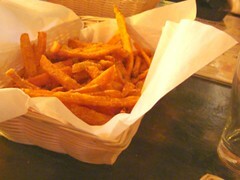 Of course, when Sarah arrived, that didn't stop us from ordering a basket of shoestring sweet potato fries for the table. Good but I still prefer the more unique pita strips. While Sarah decided to be healthy and order a falafelite salad, the rest of us decided to order their signature sandwich: the doner kebab in a lavash wrap. Again, I appreciate that the beef-and-lamb combination was substantial and flavorful without being heavy or gamey, and I liked the flavor layering between the warm slightly-spicy meat and the cooling tzatziki sauce. The veggies were fresh and crunchy too. Caroline and I splitted one of sarah's falafelites, spicier than most -- which I like -- and there were actual chickpea pieces in there that made for an interesting textural contrast. The food overall is great, but I am more amazed by the entreprenurial minds of the founders, Bryce Rademan and Robert Wicklund, two twentysomethings who took inspiration from cuisine abroad and turned into a successful business venture (the Little Tokyo Spitz is the second store, the original one is in Eagle Rock near Occidental College, where they graduated from.) Certainly gives me a little hope in my own culinary dreams. 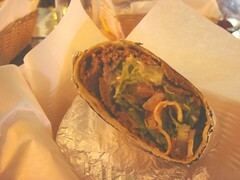 But overall, Spitz's food is well-prepared, tasty and even wholesome. It's certainly a unique eatery in the area, but I'm sure locals welcome it, it doesn't cost a whole lot (most stuff is around $10) and a nice change of pace from all the Japanese eateries. And to make it even better, I hear a Happy Hour is already in the works . . .